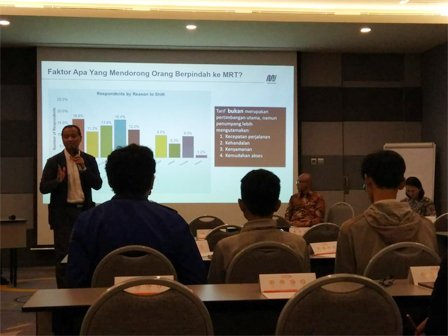 PT MRT Jakarta President Director, William Sabandar revealed, in operating Mass Rapid Transit (MRT) Jakarta, his party is about to use the communication-based train control (CBTC) made in Japan.
" CBTC is a railway-based communication control system with radio frequency (RF) as data communication between various integrated subsystems"
The system has two main functions, namely to detect train and to protect train if it goes too fast. "CBTC is a railway-based communication control system with radio frequency (RF) as data communication between various integrated subsystems," he stated, Thursday (5/31). He explained, to detect a train using a radio device or wayside radio set (WRS) stationed on the train track and on the train set. The radio is connected to the operation control center (OCC). Thus the train will operate without machinist and controlled by OCC. "That means we can know where the train location every second and won't go wrong. So the protection level is very high," he explained. From security level, CBTC system will detect if the train goes too fast. Thus it can be anticipated early. "By so signaling system is very sophisticated and safe," he stated.